I think I’ll find some sedum to plant in my new concrete planter to make it look like he’s growing hair. (I don’t know much about sedums, so if you happen to have a suggestion for one that would look really nice in the planter, please let me know and I’ll order some). The head started out as a paper mache experiment, believe it or not. Actually, if you watch this blog very often, you may recall that I made a clay original, and then created a paper mache shell over it. (The posts showing my end of this project are here and here.) When it was dry I made a silicone mold. That way, I could send the light paper mache shell and the thin rubber mold to Bellingham without paying postage for 30 pounds of clay. When it arrived, my dad, Pete Havekost, finished making the support mold, created a plug so the planter would have a space for the roots, and then poured the concrete. I think it came out rather nice, don’t you? And it will get even nicer as it ages out in the garden. I’ll also try to talk him into sending a photo of one of the potheads that he makes using a styrofoam head for the form – they have a really classic look to them, especially when planted. Jonni – Could you please tell me where you buy the silicone for the mold? Thanks so much! I buy online, at the closest Smooth-On supplier. You can do a search through Google to find the one that’s closes to you. 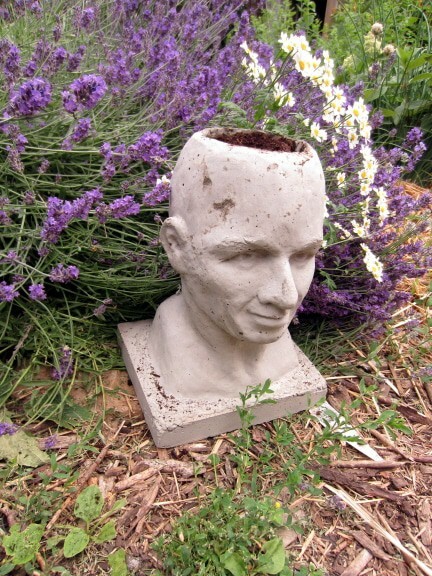 I have been searching all over the web for Pot Head Planters and FINALLY found your post. Love them! I am in Georgia and my daughter is a sedum freak. I want to make a pot for her like these. Could you please share instructions? Thank you so much. Hi Carlton. I’m so glad you asked! I did talk my dad into taking photos of the process, and now I just have to put all the photos and instructions together. It’s a bit too involved for a blog post, so we’re going to print it up into a how-to booklet. I should get started on it soon, actually, since I’m now settling in to my new house. I’ll let you know when it’s ready. Thank you so much!! I found a website “smooth-on” that takes you through a form making process that looks difficult. I wonder if your Dad’s was this complicated. Anyway, I am definitely interested in giving it a try. I did find the form your dad used on ebay but, now what to do with it… Thanks and I’ll look forward to hearing from you. Just watched your videos on making the clay sculptor of the head – really enjoyed it. You are so tallented! Pete sent a photo of his newest pothead sitting with his previous creations – all now planted by his wife, Dianne. They look pretty nice, don’t you think? I hope he does do a tutorial on how to make a head planter! Thanks, Patti. I like the dreadlock look. And I think we have Pete talked into taking photos while he makes his next planter. Oh, how exciting. What a wonderful planter. I’m excited to see what it looks like with the plants in it. That’s wonderful that you and your dad work on projects together. Sounds like you grew up in an artistic setting with lots of inspiration. How wonderful. BTW Jonni, where is the discussion on the RV Park? Guess I missed that one. That was a long time ago – there were two discussions, all just dreaming, here and here. I’m sorry I missed that discussion. Thank you for the link. Have you been to Yosemite? Breathe taking. The RV Park in Camp Nelson, CA. would have been an idea I most certainly would have been very interested in. How did you find these RV Parks anyway? The last one is listed on Zillow.com. I’ve been looking around at listings on the Oregon coast, and just happened to see it. I can’t remember why I found the one at Camp Nelson. I think that the administration of a town full of artsy types would be a big headache – something I would want somebody else to do. But it still sounds like fun. Such a great Planter! Suberb job! If you want instant age, coat the outside with buttermilk and let it soak in. Instant age with algae! I have done it on bird bath bases. However, I live in the south and it might not work in your area. What a great idea – Patch’s portrait potheads made from an actual face cast. If anybody tries this, I hope you’ll let us see how they come out! Congratulations for winning a prize for your Kazooba band, by the way! That must have been fun. Were you in the area that was hit by the storm and power outages? I’ve been making paper mache molds for hypertufa sedum garden containers for our Master Gardener’s plant sale. I was lucky to find your blog and see what marvelous possibilities this medium has. I used a Styrofoam wig stand for my ladies head slidw apart moldand lots of toilet paper tubes for a scalloped bowl. However, to answer your sedum question; Cape Blanco will give you a low but enthusiastic mass of tight silver grey foliage aprox two inches high; angelique (sp) masses of yellow folliage spirals 4 to 8 inches, yellow in summer, orange in fall, a mop head look; Blue mound, a gently rounded mound with a tailored look; and sempervivums, aka hen ad chicks, come in blues and reds for a cool spiky look. You might google sedumphotos,( one word) the site has hundreds of sedum and sempervivum photos. This site can cause total garden lust. Enjoy. Thanks, Mary. I’ll look for that site – and I know my dad’s wife, Dianne, will be interested too. She’s the one with the green thumb in this family. Do you happen to have a website or some other way that we could see those hypertufa planters that you make? I’d love to see them. We will be having a work party on Aug 4th. The plant sale committee is really enthused about the molds. I alternate between being delighted at their acceptance and total fear that I won’t have anticipated some step essential to getting them unmoulded. This was a self chosen adventure ( my husband says, self inflicted) because I felt the small cardboard box troughs just did not do justice to the medium or to adult skills. I don’t have a web site. At 72, I feel smug that I can putter around the internet and see wonderful things like your masks. When we unmould the the ship and the lady, I will send you pictures of the molds and results. If no pictures come, you know I’m in the fetal position and a massive do over is in process. A lady head came in to our church plant sale with black mondo grass for hair. She was my inspiration for the lady planter. If it was me, I think I’d stick with tradition and plant chia. This is terrific — I’d love to see something on the technical part, courtesey your dad — and see if I could make one. I’d be so tempted to make some resembling some of my nosy neighbours, and give them as gifts! If you want a redhead, I’d suggest a sedum called Dragon’s Blood, which will sort of drape, and is burnt sienna to rust in colour!